Only two years after inheriting the throne Alexander the Great decided to leave Macedonia and go and conquer the Persians. Alexander left with somewhere between 48,000 and 90,000 soldiers to begin his conquest (Engels). Depending on where he was and at what point he was in his journey he had more or less troops on hand. As he went on conquering cities and nations he gathered more troops from those cities. He would also receive more troops from time to time from his home nation of Macedonia. At the same time, however, he was losing troops to battle and by letting veterans retire and go home. Alexander being the great leader that he was, understood what his troops wanted and how to keep there moral up and keep them happy. This is why he allowed the older more seasoned soldiers to retire and either live out the rest of their days in whatever part of the world they were in at that moment or allow them to return home to their families. An army of this size needed a huge amount of supplies. These supplies would have a great range of variety to them as well. There were the basics that the soldiers would need to survive such as food and water. There were also many other things that soldiers would need such as clothing, shelter, a place to bath, wood for fire, etc. Alexander the Great used very practical ways to appease these needs. For things such as food and water Alexander simply choose his route carefully. He followed water ways such as rivers so that he had constant access to water. For food he formed a supply chain from the cities and towns he had previously conquered. He would collect a portion of the food from all the towns and use that to feed his army. He also chose a route that was fertile and had wood to have fires and build temporary shelters. All the other supplies that his army needed were supplies through a large baggage train that followed the army everywhere. Lendering, Joana. Livius. 30 July 2016. 4 October 2016. <http://www.livius.org/articles/person/alexander-the-great/&gt;. Walbank, Frank W. Alexander the Great. 7 4 2015. 5 10 2016. 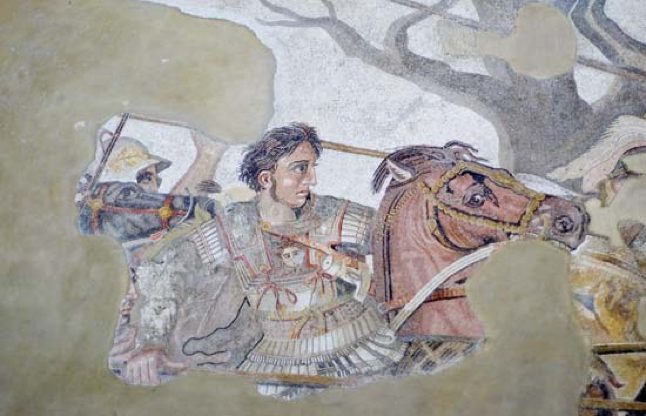 <https://www.britannica.com/biography/Alexander-the-Great&gt;. Engels, Donald W. Alexander the Great and the Logistics of the Macedonian Army. Berkeley: University of California Press, 1978. Print.